Semi Annual Retreat & Seminars for 21+. Beach Retreat training in Myrtle Beach. This event is conducted by Master Rondy and the Grandmasters of the Dragon Society International. This is a great opportunity to cultivate new ideas, refine teaching skills and build camaraderie among the school leaders. This team consists of the schools leaders. The team meets every month to learn valuable teaching and motivation skills. The team members are featured throughout the school and wear the special 3-stripe Adidas uniforms. Ask the Leadership Team for assistance. 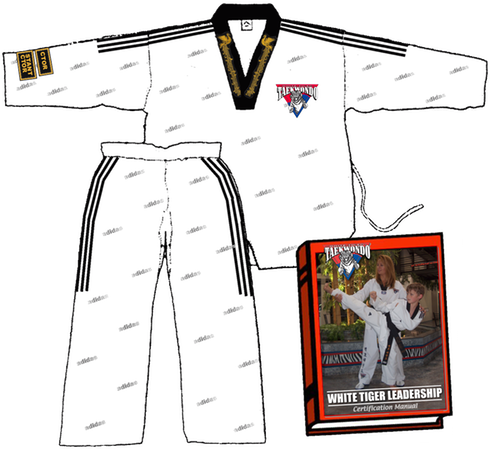 Members receive special patches for their attendance, receive bonus points that are applied to their Black Belt Test and are compensated for their assistance. Members will be sent the Leadership Team manual upon joining. Members may attend the next monthly seminar. Leadership Team is also available for Hapkido (black uniform), Lady Tigers (black and pink uniform) and Wing Chun (see office for uniform). Level 4 Patch • Issued to students with at least a 3rd degree Black Belt and a minimum of 250 assisted teaching hours. Requirements include teaching full classes (solo) and also assisted teaching of 1st degree Black Belts. Minimum 18 years old. Level 3 Patch • Issued to students with at least a 2nd degree Black Belt and a minimum of 150 assisted teaching hours. Requirements include teaching full classes (solo). Minimum 16 years old. Level 2 Patch • Issued to students with at least a 1st degree Black Belt, or unconfirmed Black Belt, and a minimum of 75 assisted teaching hours. Teaching requires knowledge of Korean terminology, warm-up, stretching and some full classes. Level 1 Patch • Issued to students with at least a Red Belt and with a minimum of 25 assisted teaching hours. LEADERSHIP WINGS • Awarded to students with a minimum of 12 hours of training in Leadership Team seminars. Patches to be placed on black "V" of Leadership Uniform. An additional FREE Leadership Team uniform will be awarded to students with 25 hours of Leadership Team seminars.